Paul Gardner and moa skeletons at the Otago Museum. The kiwi, the emu, the moa, the cassowary, the rhea, the ostrich. They’re all part of a group of flightless birds from the Southern hemisphere known as ratites, and they’re giving us some very cool lessons on how animals evolve. Otago Biochemistry’s Dr Paul Gardner and his bioinformatic colleagues from Harvard University, the Welcome Sanger Institute, and the Universities of Texas and Toronto have been using DNA sequences from these birds to figure out how species evolve, at the DNA level. 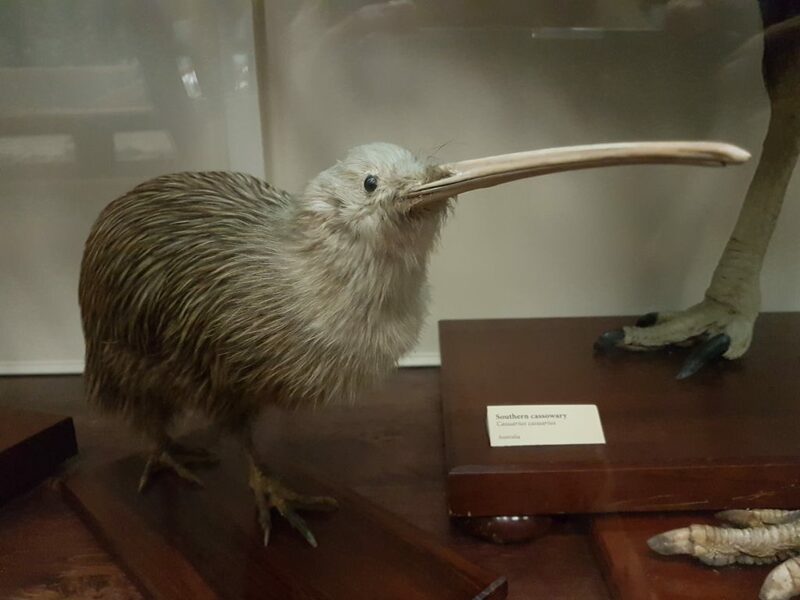 An ex-kiwi at the Otago Museum. Ratites are all related. You might therefore assume that all flightless ratites all evolved from one flightless ancestor, but you would be wrong. Yes, they did all share the same distant ancestor, but that ancestor could fly. It turns out that the ratites didn’t all lose the ability to fly at one time. Instead, the ancestors of these birds diversified into different flying species and then, independently of each other, lost the ability to fly. When separate species all evolve the same characteristic independently of each other, like flightlessness in ratites, it’s called convergent evolution. You can see the convergent evolution in the bodies of the ratites; they all have smaller wings, smaller pectoral muscles, feather modifications, and larger bodies (even the smallest of the bunch, the kiwi, is pretty big compared with most flying birds). All of the instructions for a bird to grow these features are found in the bird’s DNA. So, that means there will be convergent evolution at the DNA level as well. 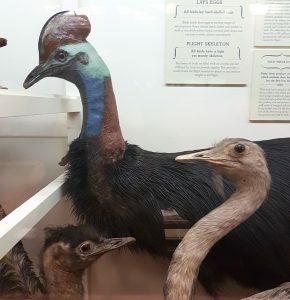 An emu, a cassowary, and a rhea (or at least they used to be) at the Otago Museum. But what parts of the ratites’ DNA has changed from that of their ancestors? What are the changes in the DNA instructions for building a body that mean the birds grow big but have little wings? 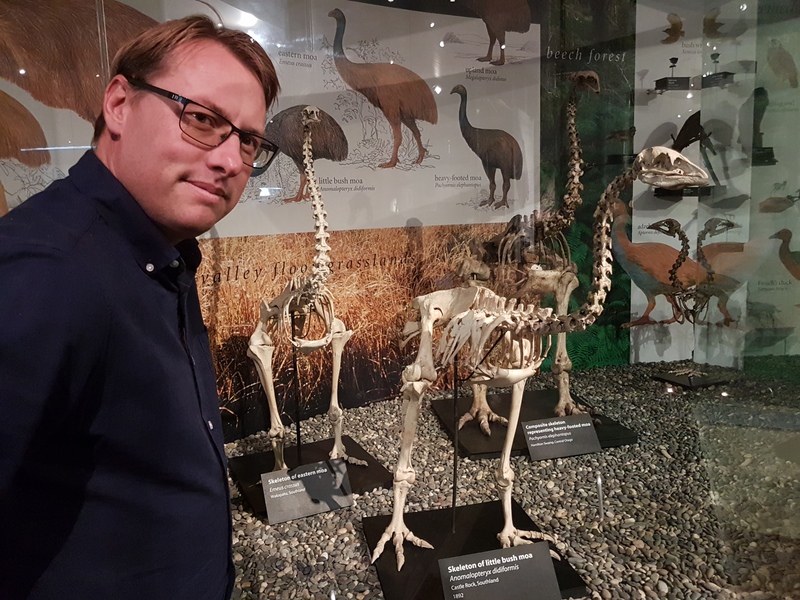 Dr Gardner and his colleagues compared DNA sequences from 44 species of birds, including nine flightless ratites, and carried out some serious number crunching to answer these questions. Put very simply, bird DNA (and our DNA, and the DNA of every living thing) is made up of two parts. There are short bits of DNA, sprinkled throughout a creature’s genome, that we call genes. Many genes are the instructions for making proteins, the micromachines that do everything that needs to be done in our bodies: breaking foods down, building cells, etc (Kahn Academy has a nice introduction to proteins here). * When evolution changes the protein gene DNA, it gradually changes the shape of these micromachines, changing what they do. The rest of the DNA, in between the protein genes, was in the past called junk DNA, because we didn’t know what it did. However, some of it we can’t call it junk anymore. Many of the bits in between, it turns out, have the very important role of regulating the genes – controlling when and where the genes are turned off and on. In other words, the flightless birds have the same genes as the flying birds they evolved from, i.e. the protein micromachines that the genes encode have the same shapes and functions. But when and where these proteins are made in the body is what makes the birds’ wings small and bodies big and means they can’t fly. We used to think that differences between related species, like for example, those between humans and our cousins the chimpanzees (compare the small groups of chimps living their hand-to-mouth existence and the amazingly complex cities of millions of humans), come from changes in our protein-encoding genes. There is now more and more evidence that these differences boil down to changes in the DNA between the genes, ie the bits that regulate the genes. It’s fascinating to find out how quirky birds like the kiwi and moa left the sky behind and made the ground their home (why they took this evolutionary path is a question for another study). But the implications of these findings reach far beyond birds, helping us to understand ourselves, and everything living thing that evolves. * Genes can encode either proteins or non-coding RNAs. ** A lot of junk DNA really is junk. The researchers found ‘signal’ in the conserved (i.e. non-junk) non-coding regions. Abstract: A core question in evolutionary biology is whether convergent phenotypic evolution is driven by convergent molecular changes in proteins or regulatory regions. We combined phylogenomic, developmental, and epigenomic analysis of 11 new genomes of paleognathous birds, including an extinct moa, to show that convergent evolution of regulatory regions, more so than protein-coding genes, is prevalent among developmental pathways associated with independent losses of flight. A Bayesian analysis of 284,001 conserved noncoding elements, 60,665 of which are corroborated as enhancers by open chromatin states during development, identified 2355 independent accelerations along lineages of flightless paleognaths, with functional consequences for driving gene expression in the developing forelimb. Our results suggest that the genomic landscape associated with morphological convergence in ratites has a substantial shared regulatory component. 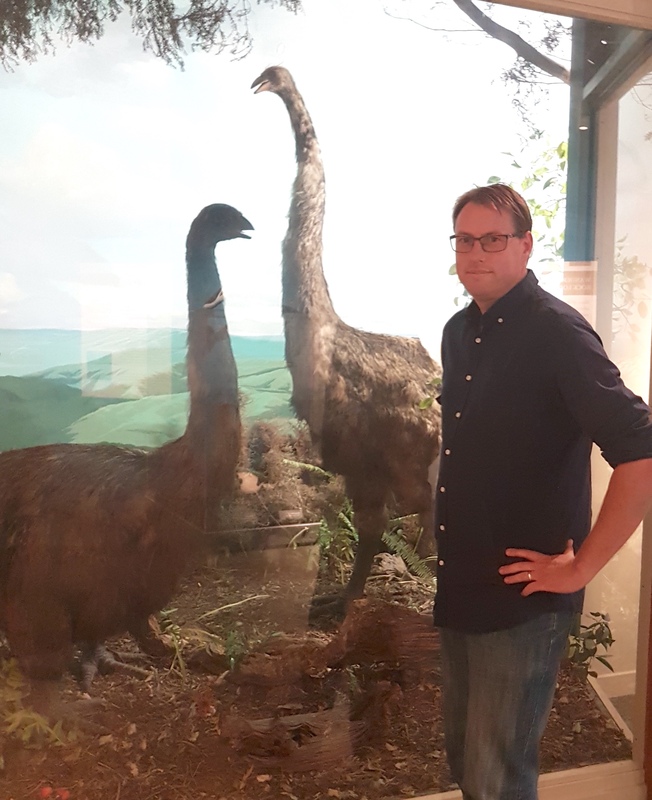 Dr Gardner enjoying a good old-fashioned moa panorama (again at the Otago Museum). This entry was posted in Uncategorised and tagged bioinformatics, DNA sequencing, Dr Gardner, evolution, genetics, kiwi, moa, proteins, ratite by Miriam Sharpe. Bookmark the permalink.